New Water Slide Maintence Tips | Dolphin Waterslides, Inc.
Congratulations on your beautiful new pool slide by Dolphin WaterSlides, Inc.! We hope you are very happy with your water slide and are enjoying the hours of fun your brand new water slide is going to add to your pool oasis. No matter if your Dolphin slide is a 10′ one piece slide, our popular 15.5′ Dolphin one piece, or a 100′ custom designed slide, your particular slide is a fiberglass water slide with a beautiful gel coat finish. That shiny, smooth finish you see on the ride surface is a result of years of research from some of the best gel coat manufacturers in the world, and years of hard work and continued effort from our manufacturing plant to provide you with the best gel coated fiberglass slides on the market. 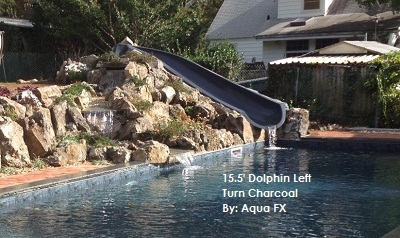 Dolphin offers you more options on colors and finishes than any other slide company on the market, because we know you want a slide that fits in with your individual pool oasis color scheme. 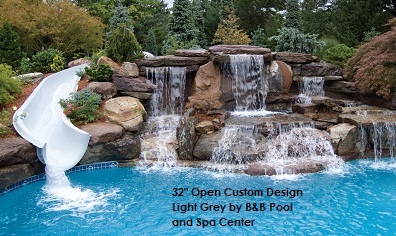 From bright whites, to neutral tans, and dark browns, all the way up the color spectrum to beautiful blues, and deep reds or dark blacks, we have a color that is perfect for your back yard pool creations. Whether you have one of these gorgeous solid color water slides, or you have one of our beautiful HD Sparkle series slide with the look of fine granite, you all have one thing in common. You want your investment to be beautiful and fun for many years to come! We have some tips to be sure that is exactly what you get. Sign up to follow our blog to find out more about maintenance of your water slide and keeping it fresh and polished year after year, and for older slides that have never been maintained, we will have tips on how to rejuvenate and restore those slides as well. Sign up to get new posts delivered straight to your inbox. The best way to keep your slide looking great is to start protecting it from day one. It is similar care you would use for your car, or for your boat. You don’t go years without cleaning your swimming pool, so don’t go years without cleaning your slide! If you don’t want the hassle of maintaining your pool slide, talk to your pool maintenance company about adding some slide care to your contract, or have a kid or grand kid earn some spending money if the job isn’t too big for them. Automotive cleaners and waxes will generally work, given that they are used from the beginning. Don’t use harsh abrasive cleaners on your new slide, and stay away from anything with ammonia, or a high ph as they can cause staining and should be avoided. Always use a mild non abrasive detergent and warm water when possible to clean the slide. Alternatives that are recommended and the ones to be avoided are shown below. Test a spot in an inconspicuous area first. The next step in new slide maintenance and the pool slide shows no signs of weathering, your only step after cleaning will be to polish the slide surface with a good UV blocking self cleaning marine or automotive wax. Waxing in the spring and fall will help protect the slides finish and provide a good added barrier to the harsh UV rays of the sun. The wax is generally all that is needed to maintain the slide and help keeps its original gloss as long as you start the maintenance process early, before there are problems. However, just any automotive wax will not be chlorine resistant and not all waxes provide protection against the UV rays of the sunlight. Follow the directions for application closely so you get the best protection for your slide. If you clean your slide and wax it and the slide shines up and looks good, then pat yourself on the back, for you have saved your slide years of oxidation, and yourself time and money by maintaining the slide, rather than adding steps and money to rejuvenate or restore it. As always, you can contact Dolphin WaterSlides with any other questions or recommendations on cleaning and maintaining your water slide.